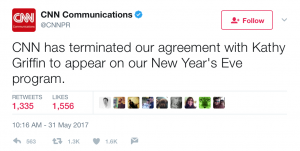 According to a tweet by CNN Communications, CNN has terminated their contract with Kathy Griffin for her annual New Years Eve Special, after she released a video of herself holding up a gorey mock-beheaded Trump mask. Advertising boycotts led by the ‘new right’ orchestrated by figureheads like Mike Cernovich, Mark Dice and Alex Jones (just to name a few) were too big to ignore. It took CNN over a day to respond with the firing. Many are seeing this as a monumental win for the right. Donald Trump tweeted in response.